Moenchengladbach/Germany, July 25, 2018 – Only a few weeks left until videogame enthusiasts will once more be able to experience exciting virtual worlds at Gamescom 2018 in Cologne/Germany. 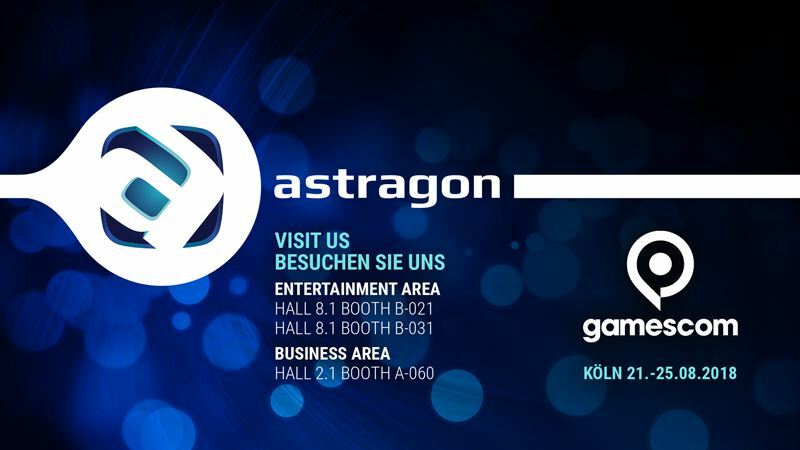 A great opportunity of course also for German publisher astragon to present its diverse game portfolio to fans and media alike in both the entertainment and business area of the world’s largest game fair. This year visitors of the entertainment area in hall 8.1 can look forward to not one but two exciting booths showing games from the increasingly popular simulation game genre. At booth number B-021 GIANTS Software will present the highly anticipated Farming Simulator 19. Here, farm fans will be able to prove their agricultural skills at the worldwide first hands-on demo of the game for PC and consoles and experience the many new features of the famous brand’s newest addition. Booth number B-031 will offer further entertaining insights into even more games from astragon’s diverse simulation roster on various platforms ranging from PCs to consoles: Visitors will be able to transport passengers in Bus Simulator, construct buildings with the Construction Simulator series, cast their nets with Fishing: Barents Sea and deliver freight with the truck simulation games by SCS Software all across Europe and North America. From Tuesday, 21stAugust to Thursday, 23rdAugust 2018 industry visitors and media representatives are cordially invited to visit the astragon booth A-60 in hall 2.1 of the business area to get the newest information on current and future games published by astragon. They will not only have the opportunity to take a closer look at Farming Simulator 19 but also receive some interesting outlooks on the future of popular simulation games and brands such as Bus Simulator, Fishing: Barents Sea, the Construction Simulator® brand and the well-known truck simulation games Euro Truck Simulation 2 and American Truck Simulator by SCS Software. Visitors interested in mobile games will also get a first impression of another truck simulation by astragon which is currently in development for iPhone®, iPad® and Android devices: Truck Simulation 19. We are looking forward to meeting you at our booth in hall 2.1 (A-60) to give you some first-hand insights into our diverse portfolio at Gamescom 2018. Our appointment schedule is now open and ready to receive your preferred dates and times via presse@astragon.de. Please indicate in addition to date and time also the title of the games you would like to see during our presentations and if you would like an interview with one or more of our developer teams.